Sometimes being the grim reaper really is, well, grim. And since Charley's last case went so awry, she has taken a couple of months off to wallow in the wonders of self-pity. But when a woman shows up on her doorstep convinced someone is trying to kill her, Charley has to force herself to rise above... or at least get dressed. It becomes clear something is amiss when everyone the woman knows swears she's insane. But the more they refute the woman's story, the more Charley believes it. Just when life was returning to normal, Charley is thrust back into the world of crime, punishment, and the devil in blue jeans in this hilarious fourth installment in the New York Times bestselling series from Darynda Jones. 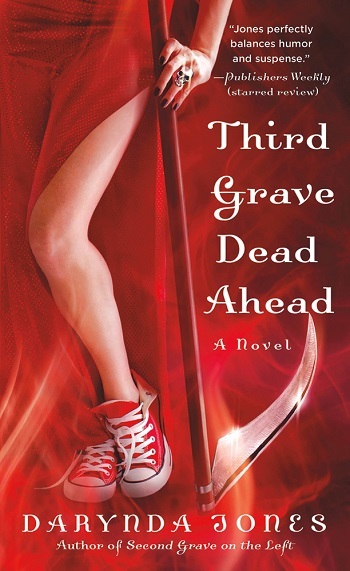 Fourth Grave Beneath My Feet is the fourth installment in the Charley Davidson series. While it would be best to read the series in order, I believe you if you'd read the first few, the reader would not be lost to jump around. While there are a few threads that tie each book to the last, it is so subtle, with the cases taking center stage. Charley is emotionally suffering at the start of the novel, a combination of agoraphobia and PTSD. Charley is terrified, yet she stays in the apartment where she was attacked, even leaving the chair exactly where it sat during her torture. Instead, Charley has barricaded herself into the apartment with unneeded home shopping network purchases, the boxes clear to the ceiling. Another emotional punch, Charley and her father are on the outs after what he did at the end of the previous novel. Charley and Cookie no longer make use of the offices they utilized on the second floor of Dad's bar across the alleyway. Which is yet another pile of boxes Charley is using to make her feel safe inside the nest she's made in her home. But Grim Reaper duties come calling. Many main threads and side threats pop in and out of importance during the novel. The uncle's arsonist. The terrorized woman asking for private investigator services. Bank robbers. Demons. The motorcycle gang. Family issues with Dad. Learning the scope of being the grim reaper. Fight clubs. Nuns at the convent. An apartment being renovated that they wanted but were told no. Ghosts and more ghosts. Reyes. All of that is a bit much to fit into a novel, so it came off as a bit chaotic, zany, and all over the place at times, losing focus of its own plot. 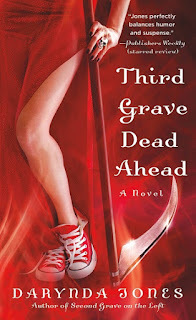 With that being said, I thoroughly enjoyed Fourth Grave, finding the same humor I've adored in the other three installments. The same confusion and gut-punch with the daddy issues, even if to me none of what's going on makes any sense with dear ol' dad. It's beyond a slow reveal with the paranormal elements featuring the grim reaper and her abilities, the portals out of hell and into heaven, and why Reyes is with Charley. A trickle from book to book. But slightly more information is given this time around. Slightly. Maybe in another eight books we'll get to the meat of the story. Highly recommend to fans of crime sleuthing stories with a paranormal twist. Cannot wait to see where the story goes next for Charley and company. After four books, I think I’m properly addicted to this series. Charley is starting to feel like an old friend and I think the writing in this book is the best yet. This story is a more complicated read than the first three books. Our tough talking Grim Reaper is still traumatised from events at the end of book three and for the first time we actually see her vulnerable and scared. But this is also the most action packed of the books so far. After four books, I think I’m actually starting to understand the whole Grim Reaper/Son of Satan storyline and the demons add a whole new level of suspense and action to the story. Charley’s PI escapades add much needed comic relief to a book that could easily become too intense. This time we get bikers, nuns, and a few great scenes from Charley’s increasingly dysfunctional family. I love that most of Charley’s PI success is almost accidental and I love how fate constantly throws beautiful men in her path. This is an easy series to binge read. I think the writing keeps getting stronger and I love how all the characters continue to develop as the series unfolds. Book #4 in the Charley Davidson series was necessary, but not my favorite. I would suggest reading these in order, to fully appreciate the building relationship between Reyes and Charley, but I believe you could start anywhere in the series and still enjoy Charley's PI cases. I'm not going to summarize the story, what I'm going to do is say that I feel the Reyes and Charley angle NEEDS more attention. I really want to see them together and working as a team, I know it would be a dysfunctional team, but it would be awesome for them to work together. This story was really all over the place. The case was an interesting one, though, and was perfect for Charley to break out of her home. Of course, nothing is cut and dry, and I will say that the resolution did surprise me on this one. I'm really hoping that the next installment brings some resolution to Charley/Reyes dynamic or brings Ubie and Cookie together. Either way, I need to see what happens next. Again this book leaves off where the last one finished, so I do suggest you read them in order to understand what is happening. Charley is still dealing with the aftermath of what happened in the previous book. I love that even though she is dealing with a lot of issues, she is still sassy. We get to see more of Reyes in this book, which I love because, well, he is yummy. I feel with this book there is a bit of a slow pace, I really hope it does pick up again in the next book. 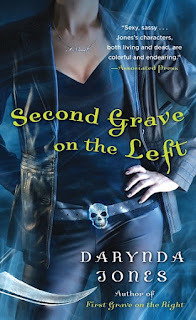 Reviewers on the Wicked Reads Review Team were provided a free copy of Fourth Grave Beneath My Feet (Charley Davidson #4) by Darynda Jones to read and review.